Bryan Dobson on the Six One News during the broadcast. THE BROADCASTING AUTHORITY of Ireland has rejected seven complaints about an incident on RTÉ’s Six One News when presenter Bryan Dobson called the Ballyhea protestors “idiots”. The BAI acknowledged that Dobson “could have handled the situation in a better manner”, but ruled that he did not breach rules on objectivity and impartiality. 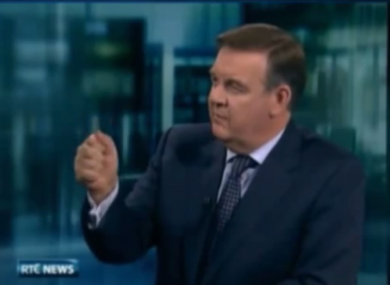 In the incident on 27 November, Dobson was interviewing economist Ronan Lyons about property prices but cut him short as he was answering a question as protestors against bondholder payments came into view behind him. The committee was of the opinion that the term used arose out of frustration at the distraction that he reasonably believed the protestors were causing and could not be seen as a comment on the message that the protestors wished to communicate. “The interview in question was unrelated to the message of the protestors and that the presenter was clearly dealing with a technical issue linked to, as he saw it, the disruption in the quality of the interview being broadcast live,” according to the BAI. “As such, the presenters comment were not viewed by the committee as those that might belittle the content of a bill being discussed that evening in Dáil Éireann,” the BAI also add. The protesters in question were there in support of motion tabled by the Dáil Technical Group on their behalf to which called on the Government to ask the European Central Bank and European Commission for a debt writedown. RTÉ had argued that Dobson made the decision to end the interview purely because the protestors had made the situation “unpredictable and potentially uncontrollable” and “so distracting as to make the interview valueless to the viewer”. “RTÉ, however, does not suggest that their behaviour was threatening, ” the broadcatster added in their response to the complaint. The BAI’s decisions on seven complaints were released today with each complaint alleging that Dobson was not objective during the broadcast. The complaints had argued that those protesting were doing so peacefully and that Dobson’s comments “could have influenced the outcome of the live debate”. Moreover, the complainants said that the protestors were there in support of the bill put forward in their name and therefore had a right to air their views. The day after the incident Dobson released a statement saying that he “never meant to cause offence” with his comments. Email “BAI says that Bryan Dobson wasn't being biased when he called protestors ‘idiots’”. Feedback on “BAI says that Bryan Dobson wasn't being biased when he called protestors ‘idiots’”.